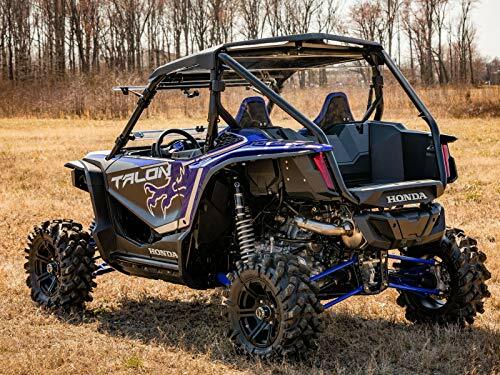 Honda will be adding even more accessory options for the TALON 1000R and 1000X models in the future so please keep in mind this list will continue to grow as these items are only what they announced at the time of launch. They’ll end up doing just like they did with the Pioneer 500, 700 model lineup and 1000 model lineups where they go back and add to the list once they introduce them. That’s only referring back to OEM Honda Genuine Accessories too for the TALON 1000 models, that’s not even counting aftermarket accessories and parts etc that are on the way for the TALON 1000 R and X models from companies like High Lifter Products among others that will be releasing TALON 1000 lift kits, arched a-arms, snorkels and many many other items. 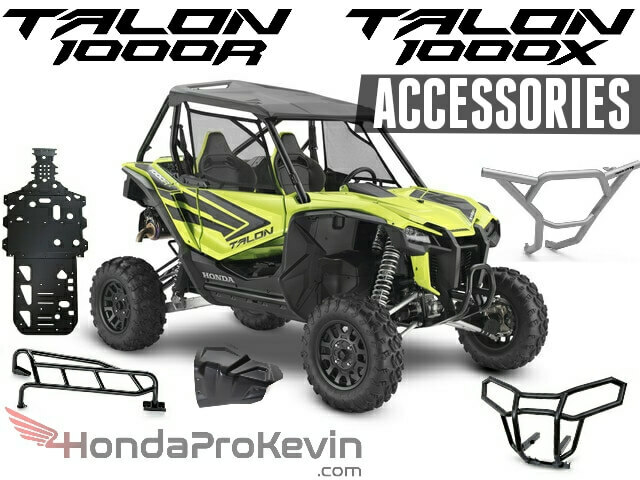 Now to the big question, when is the release date for 2019 TALON 1000 accessories from Honda? 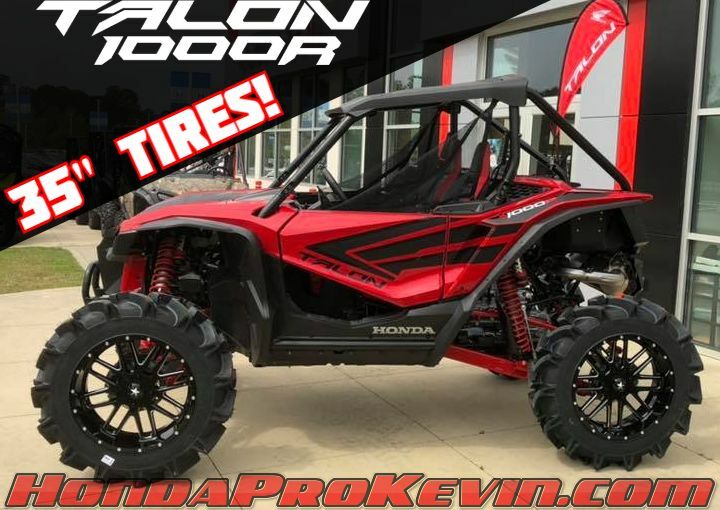 Honda is stating that they will be available to order once the TALON 1000R and 1000X models start to release and arrive at dealerships which will start in April of 2019. 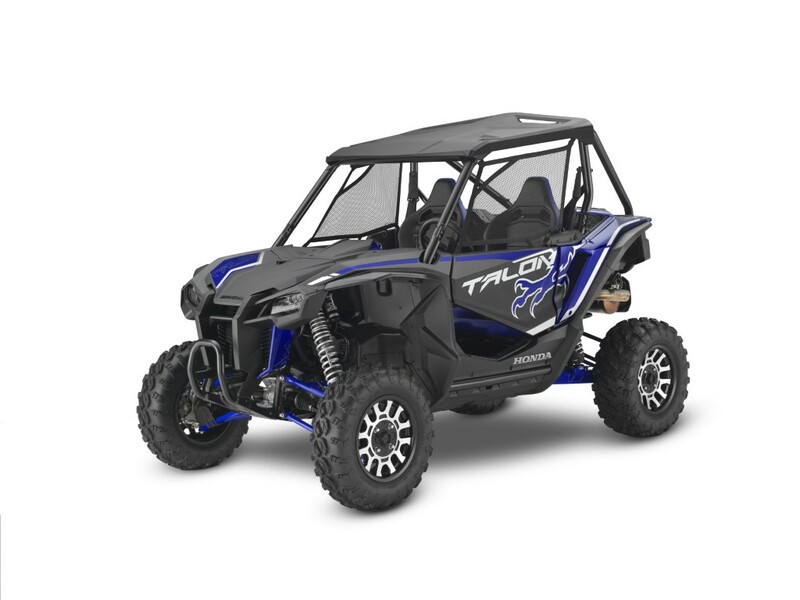 I’ll keep you guys posted with updates though between now and then as I’ll be breaking down more details with better pictures and just more info overall on all of the different parts and accessories that are on the way for the TALON 1000 model lineup whether they be OEM or aftermarket. 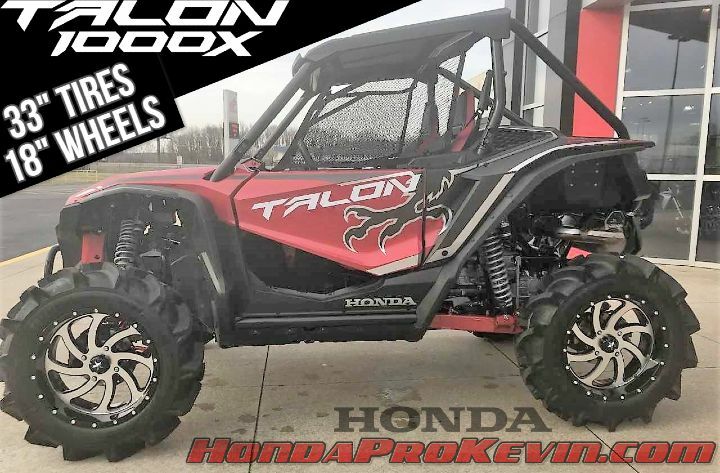 Thankfully, the TALON 1000 models won’t be treated like the red-headed step-child by aftermarket outfitters similar to how the Pioneer 500, 700 and 1000 has been when compared against accessory options for other manufacturers out there. The TALON will definitely change the status-quo on that front. Race-inspired, lightweight .080 inch thick 5052 aluminum alloy construction adds protection from weather and sun. Finished with a durable, black powder-coat. Styled to integrate with the vehicle design and is branded with a Honda Racing logo. Installs easily to existing roof attachment points. Race-inspired, highly integrated lightweight aluminum doors add style to your Talon. Single-piece stamped aluminum maximizes quality and fit. Branded with Honda Racing logo. Replaces existing doors and attaches to factory mounting brackets. Precision-manufactured steel door frames are lightweight and integrate easily with standard doors. Thermoformed panels help keep out inclement weather and enhance comfort of occupants. Fabric is water-repellent and provides superb UV and abrasion resistance as well as mold/mildew resistance. Double zipped, polished vinyl windows roll down increasing airflow thru the cab. Honda Accessory lower Door Panels Required for full door coverage. Installs to factory doors to create a unique look for your vehicle. Provides added protection from the elements. Multiple mount locations. Mount clamps included. Requires installation of accessory Switch Plate with Volt Meter. Required to install horn kit, Includes harness and switch. Stylish 40″ light bar. Multiple mount locations, mount clamps included. Consolidates all of your Honda Accessory electrical needs into a single source. Switch plate integrates easily into dash and is able to accommodate up to 5 Honda Accessories. LCD volt meter displays battery voltage and includes customizable High/Low voltage reminder. IP68 rated for dust/water resistance. Kit consists of both a windshield wiper and a washer reservoir to provide the ability to clean your windshield. Requires a Honda Accessory Glass Windshield and Switch Plate with Volt Meter. Flag is mounted on a 3/8 inch diameter fiberglass pole. Installs easily to the integrated vehicle flag mount. Flag reaches 9 feet high when installed. Features a sporty design and is adjustable for excellent rear visibility. Die cast aluminum mounting clamp. Features a sporty design and includes both driver and passenger side mirrors. Adjusts to multiple positions and angles. Die cast aluminum mounting clamps. Constructed from .177 inch (4.5 mm) thick hard-coated polycarbonate material which offers superior strength, impact resistance, durability and performance. Reduces the inflow of dust and debris. Features a zippered polished vinyl window. Polished vinyl window is resistant to cracking in extreme cold. For use with factory roof. Can be used with hard or soft tops. 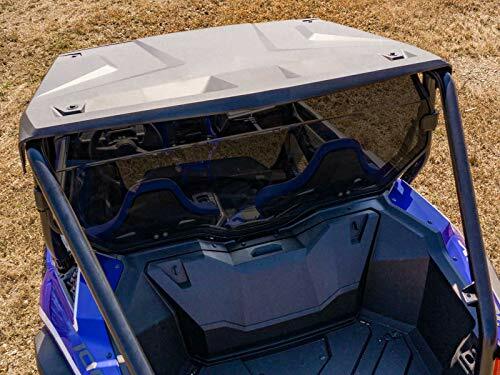 SuperATV Clear Rear Windshield for Honda Talon 1000R / 1000X (2019+) - 250x Stronger Than Glass! Our 3,500 lb. capacity winch packs the reliability and extra pull you need to help you out in most situations. It features a durable all metal gear train and end housing, and a powerful permanent magnet motor. Winch comes with 50′ of lightweight, easy-to-handle 3/16″ synthetic rope. Requires Honda Accessory Winch Mount Kit. Install Time – 2 hours with winch mount kit shown below. * TALON Warn winch installation instructions are below with mount kit. Custom designed to fit your Talon. Designed for maximum visibility and provides a more comfortable driving experience. AS1 laminated safety glass offers the highest clarity for windshields and meets the requirements specified in ANSI/SAE Z26.1-1996. Features a black powder-coated frame. Uses Honda’s unique clamp system. Honda Accessory Windshield Wiper Washer Kit available. Offers protection from dust, dirt and debris without sacrificing airflow. Uses Honda’s unique clamp system that allows for quick installation and removal. Constructed from .236 inch (6 mm) thick hardcoated polycarbonate material which offers superior strength, impact resistance, durability and performance. 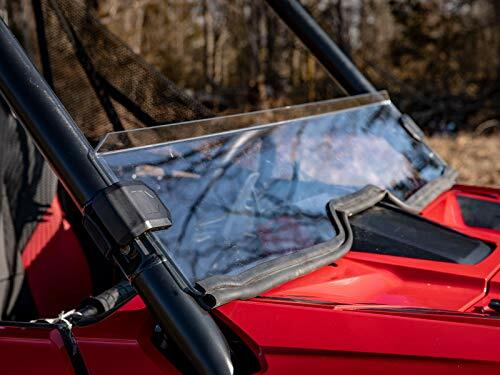 SuperATV Heavy Duty Half Windshield for Honda Talon 1000R / 1000X (2019+) - Standard Clear Polycarbonate - Installs In 5 Minutes! Premium hard coating helps protect the windscreen against scratches and promotes longer component windscreen life. Constructed from .236 inch (6 mm) thick hard-coated polycarbonate material which offers superior strength, impact resistance, durability and performance. Adjustable vents allow for individual rider and passenger control of cabin airflow. Windshield is designed, cut, and bent just for the Honda Talon 1000. That means it fits perfectly for a snug fit that won’t come loose or rattle when you’re flying down the trail. We include all necessary seals and heavy-duty Velcro straps so you can install quickly and get your UTV back on the trail. Made of 1/4” scratch resistant polycarbonate. Scratch resistant hard coating protects against harsh chemicals and UV rays. Easy installation – comes pre-assembled. 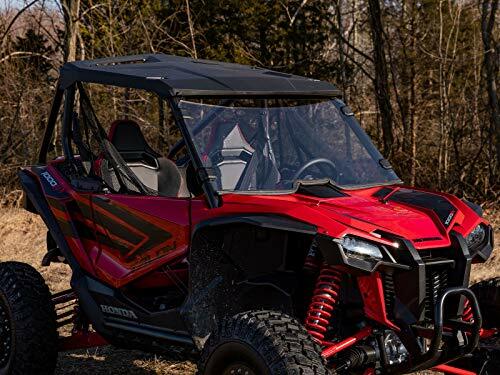 SuperATV Heavy Duty Scratch Resistant Flip 3-IN-1 Windshield for Honda Talon 1000 (2019+) - Hard Coated for Extreme Durability - Designed for Year-Round Riding! 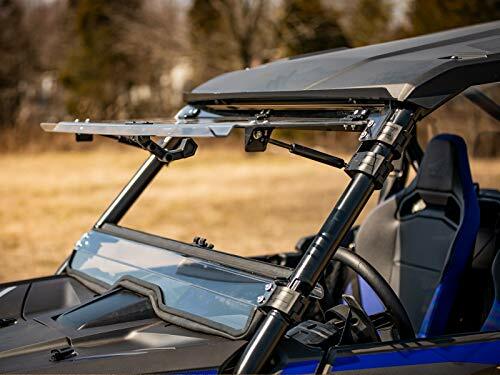 SuperATV Heavy Duty Scratch Resistant Full Windshield for Honda Talon 1000X / 1000R (2019+) - Clear - Hard Coated for Extreme Durability - Installs In 5 Minutes! Made from UV-treated, water-resistant UltraMax fabric with Fibertech accent panels. Ridged construction with reinforced plastic panels help hold the shape, and a removable center divider is included for storage separation and added support to the lid. Top lid has reverse coil zipper that opens up to the main compartment which features 4 interior zipper pockets and 2 elastic mesh pockets for added storage. Bag securely attaches to the rear cargo area using 4 quick release web-straps riveted to the bag, and the durable gripper base material helps prevent sliding. 2 side carry handles included. Constructed from high quality TriMax Ballistic Nylon with Fibertech accent panels. Bag securely attaches to vehicle using 4 quick release web-straps. Features a reverse coil zipper that opens up to the main compartment, a carry handle on the top and a mesh pouch on the front. Made from innovative UltraMax durable polyester material with the highest UV protection in the industry. The Talon cover offers 100% waterproof protection, features heat taped seams and includes a large driver�s side zipper for easy access to vehicle. Vented design minimizes condensation and allows air circulation while the snug elastic hem at the front and rear helps hold cover onto vehicle. Cover is packed in a multi-use carry bag for compact storage. Measures 131″L x 54″W x 69″H. Cover is not designed for trailering. Made from UV-treated, water-resistant TriMax fabric with Fibertech accent panels. Reverse coil zipper helps keep out dust and dirt. The protective front knee pad is removable for maximum storage. Bags mount to doors using 7 heavy duty black push pins/screws and a template is included for pre-drilling holes for best alignment. Includes bags for both left & right doors. Each bag measures 21″L x 7″W x 2″D. Requires Honda Accessory Lower Door Panels. These generously sized storage bags come with reverse coil zippers to help keep out dust and dirt. Bags securely attach to vehicle using 4 hook and loop straps. Includes both left and right bags. Each bag measures 15″L x 11.5″W x 3″D. Made from UV-treated, water-resistant TriMax fabric. The bag’s semi-ridged construction helps hold its shape and features a reverse coil zipper. Each bag measures 16.5″L x 6″W x 1.5″D. Strong, heavy-duty steel construction for added vehicle protection. Durable black powder coat adds a stylish finish. Matches the bodyline of the vehicle for an integrated look. Uses factory mount points for easy installation. Race-inspired lightweight aluminum construction adds style and protection. Set of two, 0.25 inch thick A-Arm Guards provides additional protection to the underside and the front of your suspension arms from trail hazards such as rocks and logs. Rugged High Molecular Weight Polyethylene (HMWPE) construction has low coefficient of friction which helps your Talon slide over obstacles. Set of two, 0.25 inch thick Trailing Arm Guards provides additional protection to the underside of your suspension arms from trail hazards such as rocks and logs. Set of two, 0.25 inch thick Side Skid Plates provides additional protection to the lower sides of your Talon from trail hazards such as rocks and logs. 3-piece skid plate is 0.25 inch thick and helps protect the underside of your Talon from trail hazards such as rocks and logs. Includes black powder-coated steel junction links between the plates for a seamless fit. Matches the body line of the vehicle for an integrated look. 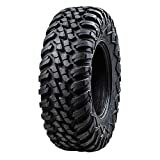 Heavy duty, large diameter, steel tubes help protect your vehicle from rocks and debris. Features durable black powder-coat finish. Made from durable, non-slip rubber to help protect the inner floor of your Talon. Features a tight, contoured fit to help keep the mat in place for an integrated feel. Branded with the Talon logo on both the passenger and driver sides. SSV Works Audio System includes two 6.5″ Powersports Speakers ruggedized for the outdoors with 25mm Titanium Tweeters for ultra bright highs. Molded kick panels optimize sound quality without compromising legroom or ergonomics. On-dash media controller features Bluetooth, Aux-input, AM, FM and a large hyper-white LED backlit display and buttons. Powered by 50 watt x 4 channel amplifier. Plug-&-Play installation includes necessary cables, hardware and instructions. Install Time – 2 hours including the winch mount kit below.